Indian officials have begun relocating some 300 crocodiles from a reservoir next to the world’s tallest statue to allow a seaplane service for visitors. The animals, some around 3m (9ft) long, are being lured into metal cages and sent elsewhere in the western state of Gujarat. The bronze-clad statue sculpture, located some 200km (125 miles) from the state’s main city of Ahmedabad, has become a popular attraction. But there are no train services and most tourists reach the site, known as “Statue of Unity”, by bus. Local forestry official Anuradha Sahu said the instruction had come from the state government “for safety reasons as the tourist influx has increased”, AFP news agency reports. So far about a dozen crocodiles have been removed and transported on the back of pick-up trucks. Community Science Centre Director Jitendra Gavali said the decision to remove the crocodiles was a violation of the country’s wildlife protection legislation. “The government is disturbing their habitat and putting their lives at risk,” Dr Gavali was quoted by the Times of India as saying. Bittu Sahgal, editor of the wildlife magazine Sanctuary Asia, was another critic of the plan. Prime Minister Narendra Modi – who, like Patel, was born in Gujarat – commissioned the statue when he was the state’s chief minister in 2010. In recent years, Mr Modi’s ruling Hindu nationalist Bharatiya Janata Party (BJP) has embraced Patel in an attempt to claim his legacy. 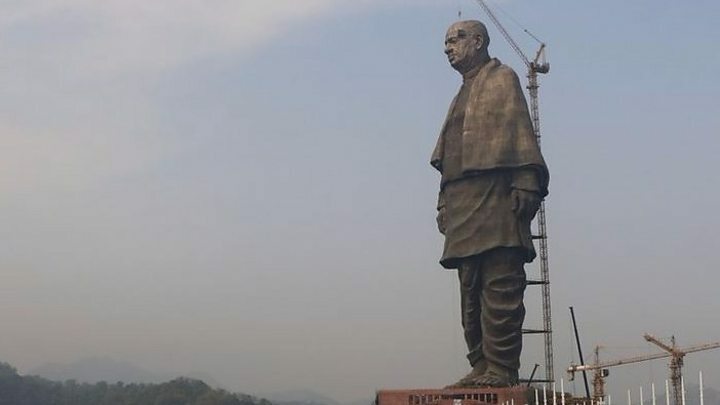 The statue cost 29.9bn rupees (£330m; $430m).